Story and Photos by Simon Vaughan, Senior Editor, Outpost. We rounded the final bend and proceeded up a tree-lined avenue towards a cobblestoned square. Elderly men in Borsalino hats played cards by a church, while children competed at tabletop soccer outside a small bar. We came to a stop in front of the comune, or town hall, just as the door opened. All heads turned to watch. I felt like I was in a Wild West saloon. No sooner had the swinging doors swung behind us and our spurs stopped jangling than glasses were downed and the proverbial piano player went silent—the strangers had arrived in town. Just a short while earlier we had fought our way free of Rome’s swarms of scooters, their riders looking more elegant than any other two-wheeled commuters anywhere in the world. We had hired a car and driver, and thus far driven past apartment buildings with French windows revealing high ceilings and interiors worthy of Fellini’s La Dolce Vita, before continuing on to open countryside. Villages clung to hill tops, blurred and sepia in the hazy, hot summer distance, while olive groves and soaring cypress trees slipped by. We passed the turnoff to Arsoli, idly wondering what you call someone from that town, other than unfortunate, and soon after took our own exit. Ahead, fireworks burst in the bright afternoon sky, their bangs resonating off the mountains. A procession making its way through Camerata during Festa. And then we had arrived at our destination. Attilio was to be our host. Recently elected deputy mayor of Camerata, he and the mayor had a long list of plans, including a museum and efforts to attract more visitors to this town of 480 people that was just 50 km from Rome. “Come into my office,” he added, leading the way. A teenaged boy was dispatched to the neighbouring bar, before quickly reappearing with a tray bearing glasses of genziana, a local aperitif. So much for a quiet few days in a sleepy Italian town, I thought, as I dodged a group of children kicking a soccer ball against the church wall. The following morning we were awakened early by the ringing of the church bells. We opened the wooden shutters and gazed at sun-soaked mountains. I had eaten—and just maybe drunk—a little too much the previous evening. The hunters had been gathered behind a house on the edge of town. An enormous chunk of roasted wild boar took pride of place in the centre of the table, surrounded by masculinity-testing peppers, hand-torn hunks of fresh bread, and jugs of home-made wine. The wine was second in quantity only to the hospitality, and, as you may imagine, we had waddled home later than planned. The medieval town of Camerata Vecchia (or old Camerata) overlooks Camerata Nuova (or new Camerata). Only in Europe would something new still be 150 years old. 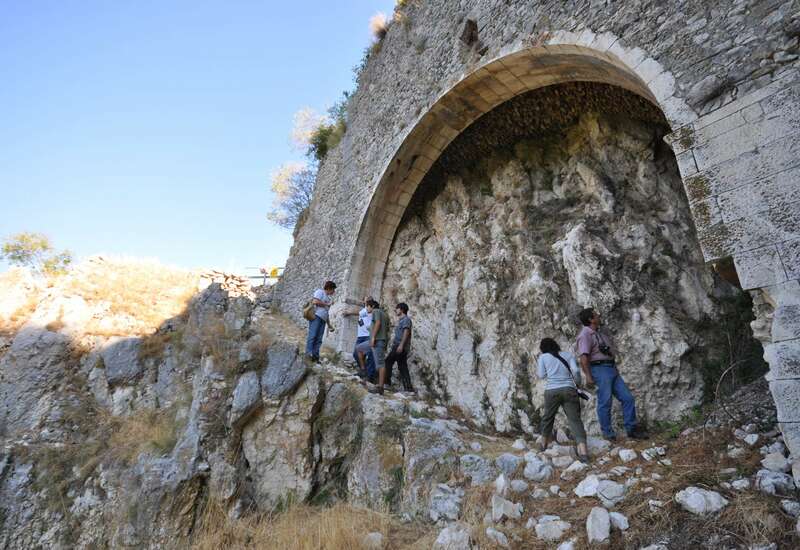 To the uninitiated, its ruins seemed to be nothing more than a collection of jagged cliffs; but upon closer inspection—or having been tipped-off by a grappa-wielding local—large stone arches can be identified. Countryside and views of “Old” Camerata. Our exploration of the old town was to begin at the comune. Attilio introduced us to Stefano Nardi, a local B&B proprietor, who is, along with wife Sonia Rossetti, a member of the Associazione Pro-Camorata: an organization created to help preserve and promote Camerata’s history. “You know that Camerata Vecchia was destroyed by fire, si?” Stefano asked. “Well, before we head up I wanted to show you this,” he said, gesturing to an enormous painting. It depicted a group of people assembled outside a church, some with faces buried in hands, others raising their arms to the smoke-filled heavens while a town blazed behind. 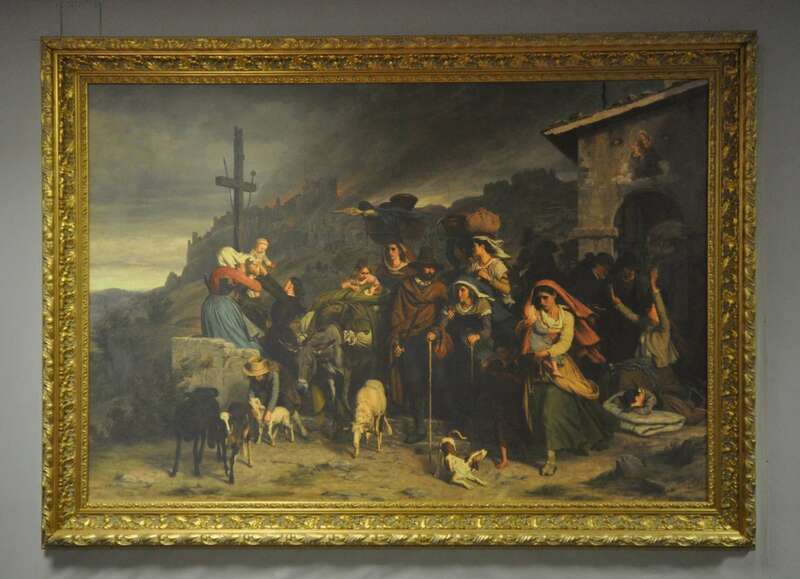 “The Fire in the Sabine Mountain” by Swiss artist August Weckesser. “Let’s see the real thing,” Stefano suggested, while Attilio added that he would meet us at the braciolata later in the day. Camerata Nuova sits 810 metres above sea level, while Camerata Vecchia is at 1,200 metres and the neighbouring Camposecco—part of Monti Simbruini Regional Park, where we would have the braciolata—is at 1,400. Camposecco’s network of caves and subterranean waterways is popular with spelunkers. This group came from Tuscany. Outside we met Sante Fioravanti, a member of the Corpo Forestale, or forestry police, and another local historian. Sante led us up a steep foot path through the woods. 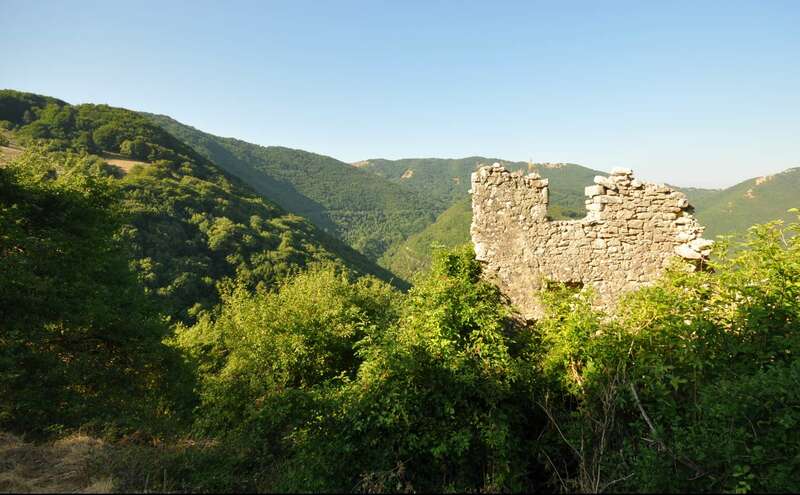 As we emerged from the tree-line we were presented with a sweeping panorama of the medieval ruins. At home, I mused, this would be a carefully preserved national historic site, complete with T-shirts and gift shop; yet here, it was known only to a few outside of Camerata and visited by even fewer. Camerata was founded in 900 AD, on the border between the Papal States and the Kingdom of Naples. It was a windswept spot devoid of a water supply, but what it lacked in mod-cons it more than made up for being far from the diseases and raiding parties that plagued the plains below. It was also a strategically important spot coveted by its periodically-warring neighbours, and no expense had been spared in providing it with thick walls, a towering castle and a single entryway. It was considered impregnable. The foundations of Camerata Vecchia’s impregnable medieval castle. We trekked around the ruins, lazily painted with vibrant wild flowers. We gazed into subterranean bricked cantinas and hand-dug wells where valuable water had been stored. 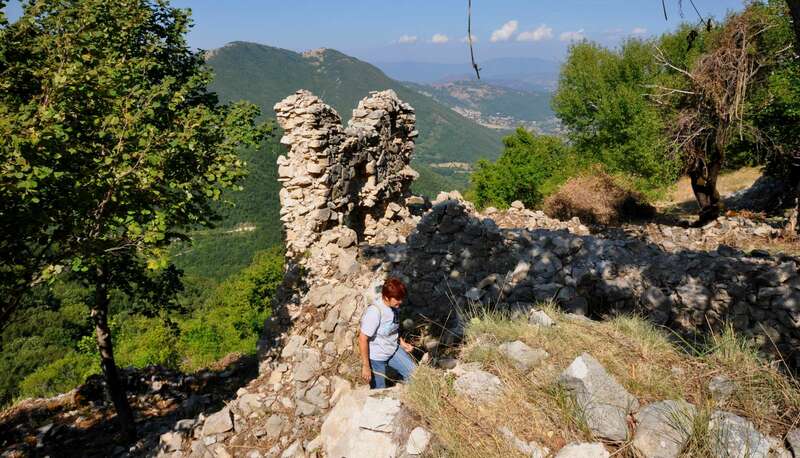 We clambered over the town’s high walls and examined the remnants of the three churches, while all around were precipitous drops to the beautiful rolling countryside. Some of the ruins of Old Camerata. We continued our trek until we reached an iron cross that overlooked Camerata Nuova far below. We continued to wander around the site, imagining what it must have been like on that cold January night. A red fox stood watching us, wondering who was trespassing on his private patch. Within the crumbled walls of one of the churches we came across a slab of marble covering a crypt, the corner slightly ajar. I peered into the darkness, and as my eyes adjusted to the centuries-old gloom, I made out a pile of skulls. And now it was onward to the braciolata, she insisted, while there was still food left! There’s a reason they call them Spaghetti westerns. 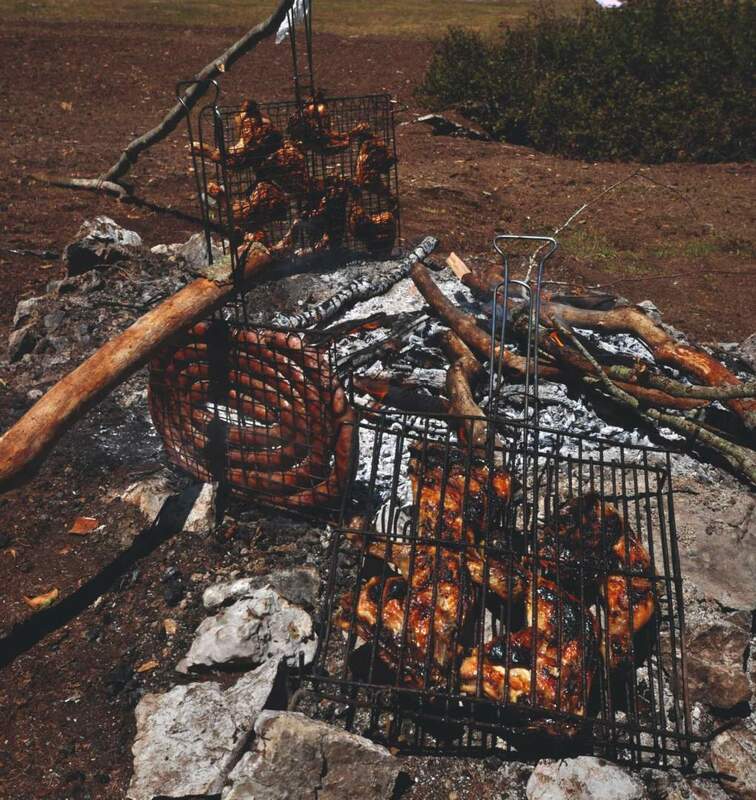 A braciolata is like a barbecue—except with the sort of gourmet flair that only Italians can muster when in the middle of nowhere. A line of picnic tables stretched along the edge of the woods, while racks of meat cooked over a fire pit. Bottles of homemade wine lined the tables, along with genziana. There were wheels of cheese, jars of olives and huge loaves of bread. 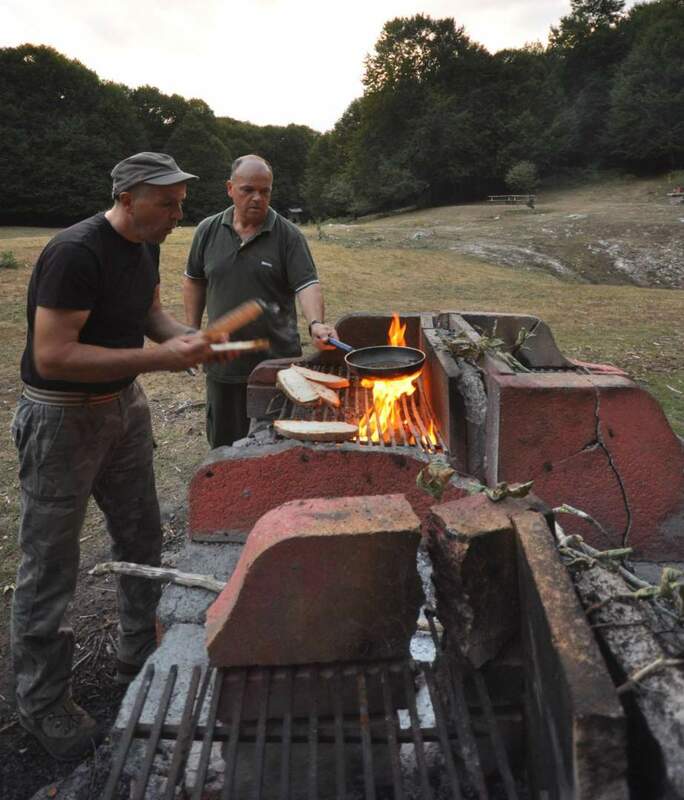 A braciolata is like an Italian barbecue, with meat cooked over an open pit. This was potluck on a grand scale, and there wasn’t a vacuum-sealed pack or mass-produced cheese plate in sight. Over the fire sizzled lamb and pork chops, steaks and chicken breasts…and of course, the ubiquitous gun-metal espresso pot. I sipped my wine and surveyed the flat plain before me. It was a stark yet beautiful limestone vista that seemed somehow vaguely familiar, even though I had never been here before. “Do you recognize it?” Sante came alongside and asked. At that moment a group on horseback rode past, just to complete the picture. Camposecco’s pastures and limestone vistas were used by farmers and hikers—and filmmakers for Spaghetti westerns. Perhaps that’s why I had had the sensation of walking into a saloon when we had entered town the day before! 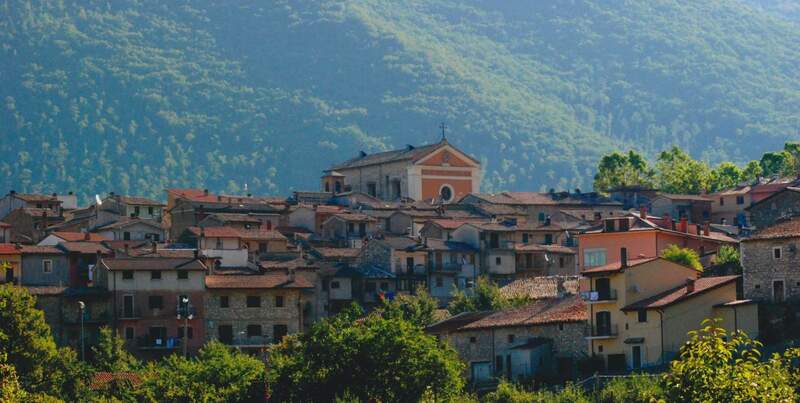 Camposecco, plains of beauty and underground secrets. Camposecco is more than just spaghetti cookouts and spaghetti westerns. The area is popular with hikers and hunters, campers and cave-explorers, geologists, nature lovers and at least one Pontiff: John Paul II was once spotted paying a quiet, unannounced visit. During the Second World War, the altiplano was considered for a landing strip by the occupying Luftwaffe, but its underground waterways left the Germans envisioning their aircraft plunging into giant sinkholes. Their fears were not unfounded, as more than a few horses and cattle have disappeared into deep, dark sink holes. And then there’s the local legend that has strange Loch Ness-like creatures living in the subterranean world, and occasionally raising their heads above the ground…maybe for a cheese wheel. Chops dropped, Attilio took us off to explore the Pozzo del Gelo or Ice Chasm. We drove across the plains before entering the dark woods and then clambering into a deep hollow sheltered by an enormous overhanging rock. As we trekked down, the temperature dropped noticeably and our breath condensed in the increasingly frigid air. At the base of the cave there was a vast supply of natural ice. On the drive back we saw a group of spelunkers gathered around an opening, and we headed over for a chat. 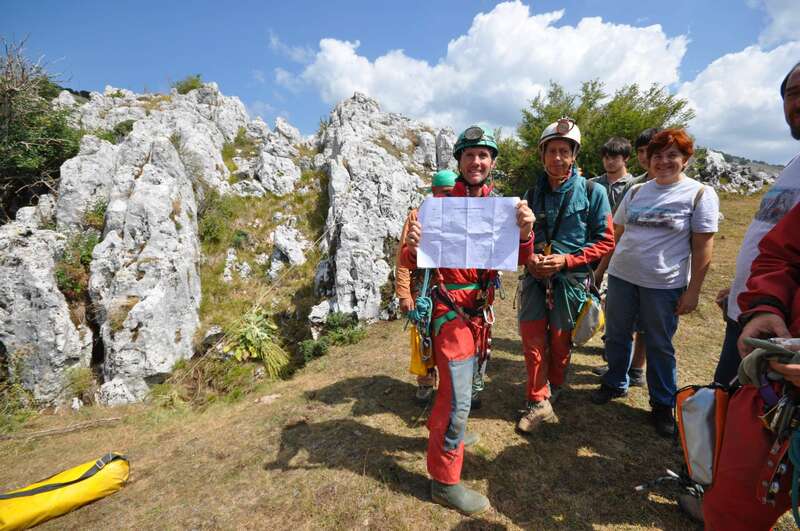 They had come from Florence to spend a couple of days exploring Camposecco’s caves, and as they donned helmets and roped up, they showed me their maps. Camerata lies in the bucolic Italian countryside not far from Rome. We trekked over to a hole that was three metres in diameter and at least 15 metres deep, marked by a crude wooden fence. The spelunkers went into paroxysms of glee at the prospect of taking a giant leap for mankind. They secured the rim and hammered their anchors into the rock, taking meticulous care with their preparations, roping off as each went to the edge to peer into the unexplored void, as if planning an assault. After a while, the call of the sausage was too strong, and we returned to the fire pit, wishing our new friends good luck. Culinary rare gem—the infamous Italian truffle. There’s an art to surviving Italian hospitality. Rule number one is never ask for or encourage second helpings—there are always more courses than you can imagine. Restaurants are bad enough, but nothing compares to an Italian home, especially if you’re a visitor. Just when you think you’ve survived and it’s time for desert, out comes course No. 3, and you’re really no closer to the entrée. And the cheese plate is still several days away. Attilio pulled up in his 4WD, two pet carriers lashed to the back housing the truffle dogs. I pictured large, hairy, frothing-mouthed tracking beasts, saliva flying as they strained at their chain-link leashes. Instead, the barks emanating from the cages were of a fluffier, more high-pitched, yapping variety. I gazed quizzically and ventured forward, being sure to keep my fingers clear of the bars, fully aware of just how dangerous hunting dogs can be. Pressed hard against the door was a small ball of white fluff, its little dark eyes about as malevolent as a cup of hot chocolate on a cold winter’s night. The occupant of the second crate was of a similar disposition. Clearly truffles didn’t fight back, or these two would have been dispatched to the hunting afterlife a long time ago. We headed deep into the Red Riding Hood forest. The occasional shaft of light speared down through the high canopy, but entering Camposecco’s woods was like going from day to night, instantly. We drew to a stop and Attilio clambered out, accompanied by his brother Massimo and young nephew (and truffle-hunter in training) Filippo. Attilio stepped around and let loose the dogs of war…which tumbled to the leaf-strewn forest floor and bounded around like balls of pent-up wool. Simulating a truffle hunt for Simon. From the bag he removed a small black lump about the size of your mama’s meatball. He held it forward between forefinger and thumb. The smell was very strong, very rich and very earthy. Truffles are a type of fungus, a subterranean mushroom that is coveted by chefs and fancy restaurants throughout the world. Super truffles command super prices at truffle auctions, with the king truffles displayed in glass cases, and minute shavings removed for the more discerning—and deep-pocketed—diner. These were black truffles, and worth about 300-400 euros per kilogram. Not far away in Carsoli they had white truffles, worth even more. We set off through the woods, the savage canines frolicking and bouncing at our heels. Attilio, armed with his truffle stick and a large knife, led the way. With the demon dogs bounding out of sight over a sun-dappled hill, he bent down and dug a hole with his stick. He trod the ground flat, and we walked several metres away before he whistled to the dogs. A truffle in all its glory. “Lampo! (Lightning! ),” he called, a name befitting an expertly-trained fine purebred beast. “Puffa! (Smurfette! )!” OK, so maybe names are overrated, I thought. The dogs ran at us, and quickly catching the scent of culinary gold, set to work to unearth the buried treasure. Within moments, Puffa was busy clawing at the ground. 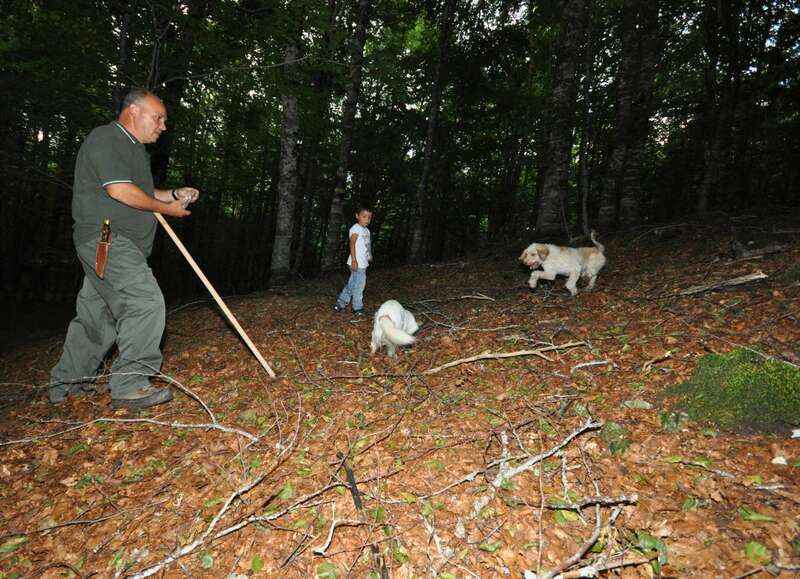 Attilio gave her a hand, retrieved the truffle and rewarded both dogs before freeing them to continue their frolic. Attilio explained that he started training truffle dogs at about eight months of age (yes, I mean “eight months!”). If they didn’t catch on quickly, he moved on to another one. He raised quite a few over the years. Some had retired or passed away, while others had simply disappeared. Truffle season runs from October to March, and Attilio has spent many a freezing cold winter’s day, knee deep in snow, trudging through these woods with his dogs. It’s hard work, but the rewards are worthwhile. Brothers Attilio and Massimo Fracassi prepare the truffle bruschetta. “What do you do with all your truffles?” I asked, as Attilio knelt down and reburied his now-thawing example. We continued through the woods, the dogs bouncing all around, Attilio burying, the dogs finding, Attilio retrieving, the dogs being rewarded, Attilio burying, the dogs retrieving. We entered a clearing and headed for a brick hearth beside a picnic bench where Massimo met us. Attilio washed the earth and doggy-dribble from the truffle, and began to grate it into a large frying pan with some olive oil and a little garlic, while Massimo started a fire. The concoction was soon sizzling in the pan, even as the sun was dropping fast and the shadows lengthening. “This is when the wild boars come out,” Attilio said, as he withdrew his knife from its scabbard and began to cut a mammoth loaf of fresh bread into thick, manly slices. “They can be dangerous, can’t they?” I asked, trying not to betray a fear. He handed me a slice of bread toasted on the grill and smeared with chocolate-brown truffle, like piping hot truffle bruschetta. I raised it to my mouth, the once almost pungent odour of the fungus now melted into a delicious rich buttery scent of earthy warmth… and maybe even a hint of fluffy-dog breath. It melted in my mouth, taste buds dancing at flavours never before experienced. It was like manna from the woods. “Delizioso!” I exclaimed, showing off my vast Italian vocabulary. On the end of his sabre Attilio handed me a few slices of pecorino cheese made by a local farmer, and poured me a glass of wine from his own cantina. If ever the world ended, I reflected, the Cameratani would live very well without the rest of humanity. Attilio cracked a fresh egg from one of his own hens (of course! ), and scrambled it with the remnants of the now truffled olive oil. 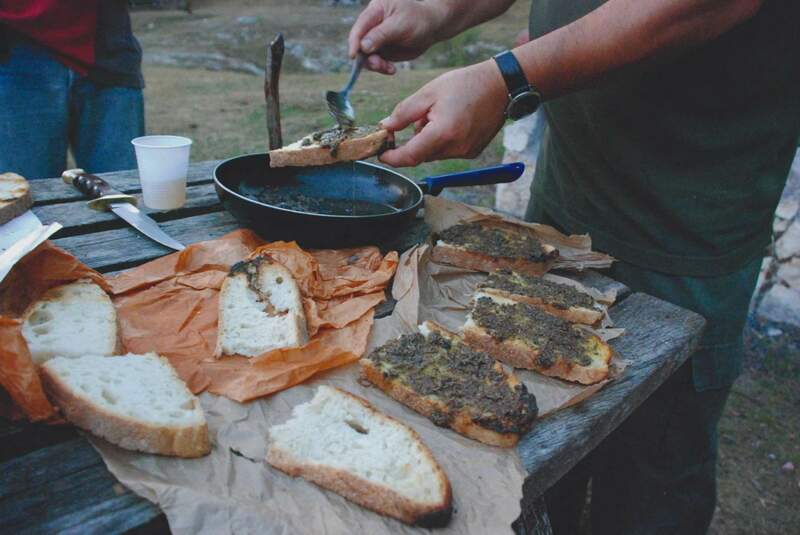 “In a good restaurant a plate of scrambled eggs cooked in truffle oil sells for 18 euros,” he explained, as I began to worry in case he presented me with a bill for our rustic outdoor feast. With Lampo and Puffa yapping behind us, we followed the vehicle’s headlights through the dusk and descended back into town, our lungs full of fresh air and our stomachs full of fine food. It was just another day in Camerata. A jazz band was playing on the temporary stage in the piazza when we got back to the town. There was a banner erected in memory of the renowned jazz musician and frequent visitor Massimo Urbani. The streets leading away from the square were lined with grills and braziers offering tantalizing sausages, chops and chestnuts, the smoke spiralling into the night’s sky. The brass band walked straight through my bedroom shortly after the crack of dawn…or so it seemed, as I lay comatose on my full stomach, visions of sugo and pomodori dancing in my head. I shot to my feet only to realize that the noise was actually outside. From the small balcony, I watched them march along the narrow street below. It was 7 a.m. and festa day. 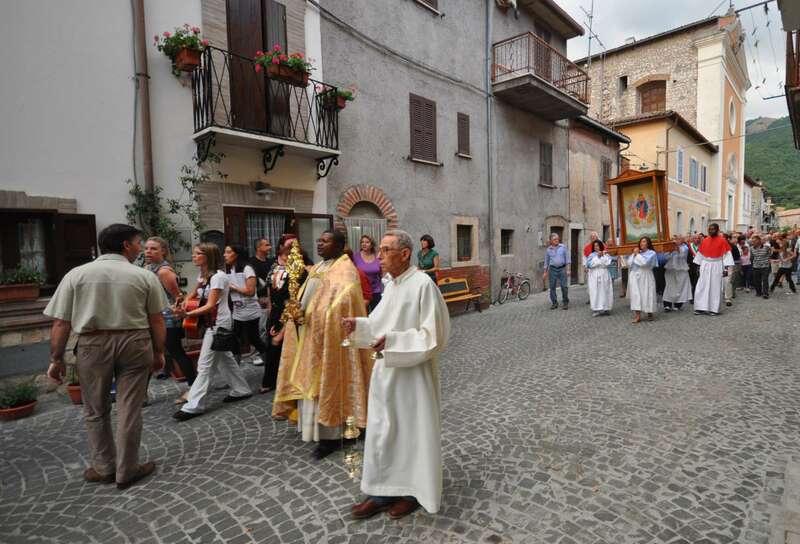 Every Italian town has its saint and all are commemorated during the festivals. Camerata’s is St. Egidio. By the time we reached the piazza the band was assembled in front of the comune, and Attilio was lined up with the mayor and the local Carabinieri police chief. The town’s priest gave a blessing and the procession began, winding its way through the labyrinth of streets, the church’s sacred statues hoisted on shoulders by pallbearers struggling beneath the immense weight. The band led the way and the entire town either joined in the procession, or watched from their doorsteps and balconies. The tradition and sense of occasion were very moving…until the band played the theme song to The Godfather. Now don’t get me wrong, it’s a great piece of music from one of my favourite films—but hearing it played live in a small Italian village had me scanning the crowd for men carrying violin cases. When the fireworks suddenly burst overhead with a rat-a-tat-tat, it’s possible, just maybe, that I dived for cover in the nearest doorway. This had been our last full day in Camerata. It was evening, and we walked back to our lodgings. Just hours earlier it had been a hive of activity; now, it was silent. There were no children playing in the piazza, no elderly women in black seated on the benches beneath the fizzing yellow street lamps, and barely even a stray cat. Instead, everyone was watching il Calcio, or soccer, on television from Rome. There were two matches on: one involving the blue-supporting half of Camerata, SS Lazio; and the other, the red and yellow half, AS Roma. There is no love lost between the two sides that share time in the Eternal City’s Stadio Olimpico, and the divisions in Camerata were similarly frosty. Our footsteps echoed on the deserted cobblestones, as curses and cheers drifted from open windows. Someone was winning and someone was losing, it seemed. For your side to lose was bad enough, eased only somewhat if your mortal enemies also lost. But for your side to lose and your mortal enemy to win?! Well, that was simply unbearable. We left the noise behind and headed into the darkness and away from Camerata Nuova for the last time. Story and Photos by Simon Vaughan, Interpreter: Alessia Urbani. Simon Vaughan, a seasoned travel industry expert, is senior editor and special travel consultant for Outpost.